SACRAMENTO, California, March 2, 2010 (ENS) – The California Air Resources Board has adopted a measure developed with representatives of the electrical utilities that will limit and monitor the emissions of the greenhouse gas sulfur hexafluoride, SF6, from high-voltage electrical applications. Sulfur hexafluoride, SF6, is used by utilities for insulation and current interruption in electric transmission and distribution equipment. 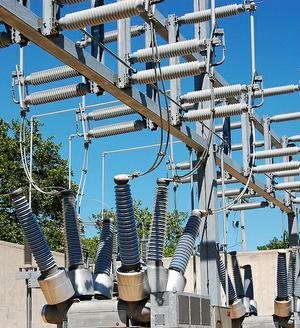 Since the 1950s the U.S. electric power industry has used SF6 widely in circuit breakers, gas-insulated substations, and other switchgear to manage the high voltages carried between generating stations and customer load centers. Sulfur hexafluoride is the most potent greenhouse gas in existence. With a global warming potential 23,900 times greater than carbon dioxide, one pound of SF6 has the same global warming impact of 11 tons of carbon dioxide. It is also very persistent in the atmosphere with a lifetime of 3,200 years. The new Air Resources Board regulation, approved Thursday, is designed to achieve a 70 percent reduction of SF6 emissions in electrical utility applications in 2020. SF6 is an inert and non-corrosive gas used to insulate switches for high-voltage current applications, typically found in the transmission grid of electrical utilities. These applications constitute 80 percent of the states total SF6 emissions. Effective January 1, 2011, the rule sets an initial emission rate at 10 percent of owners SF6 capacity. Beginning in 2012 owners of switches using SF6 must reduce emissions by one percent each year, reaching an emission rate of only one percent by 2020. To reduct their emissions utilities have several options; they can conduct leak detection and repair using handheld sniffer devices and cameras. The utilities also can employ trained and certified personnel to collect and recycle the SF6, and the utilities can also refubish or replace existing equipment. The cost of implementing this measure is estimated to be $4.5 to $7 million over the 10-year period. Consumers can expect to see this reflected with an increase of one cent per residential utility account each month. The Global Warming Solutions Act, or AB 32, signed by Governor Schwarzenegger in 2006, requires the ARB to draft and implement strategies that will reduce the states greenhouse gas contributions. On the federal level, 81 utilities are participating in the U.S. EPA’s SF6 Emission Reduction Partnership for Electric Power Systems. The collaborative effort between EPA and the electric power industry seeks to identify and implement cost-effective solutions to reduce sulfur hexafluoride emissions. California utility Pacific Gas and Electric is one of those 81 utilities. In 1999, PG&E was among the first companies to join the partnership to respond to the issue of climate change; to learn SF6 management and emission reduction techniques from other utilities; and to manage the escalating cost of SF6 gas purchases. In 1999, PG&E set a three-year goal of reducing annual SF6 emissions by 50 percent from a 1998 baseline and achieve this goal. Efforts to reduce SF6 emissions at PG&E resulted in the discovery that more equipment was leaking than the company previously thought. The improved leak detection program, including use of a laser camera to identify leaks, more than paid for itself through cost savings gained by leak reductions. In April 2006, PG&E estimated that it could save an additional $50,000 to $100,000 annually over the next 10 years through improved SF6 handling. These savings assume continuation of the aggressive leak mitigation measures, replacement of older SF6-filled circuit breakers, SF6 recycling and inventory reductions and extended warranties from equipment manufacturers. In 2009, PG&E reported that the company had reduced its SF6 leak rate by more than 50 percent since 1998, and its absolute emissions of SF6 by approximately 40 percent.